- 10% discount for all reservations made and paid until 10 November 2017! 7=6 during 01 Dec - 21 Dec 2017 & 04 Jan - 10 April 2018! 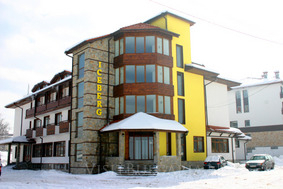 Location: Hotel Iceberg is a modern 3 storey building in Basko regional style. The hotel is located very close to the Gondola lift base station(about 800m), in the new part of the town. Room Facilities: direct dial telephone, satellite/cable TV, minibar, bath/WC, hair-drier, balcony, non-smoking rooms. In the double superior rooms offer two folding sofas, (possible accommodation: min 2 pax / max 2 adults and 2 children or 3 adults); only one superior double room has a balcony. Hotel Facilities: restaurant, lobby bar. At guests’ disposal is also ski storage room. The hotel offers to its guests complimentary daily transfers to the Gondola lift base station. Spa & Wellness: Iceberg hotel offers indoor swimming pool, Jacuzzi, steam bath. Iceberg hotel also ofers a conference hall for business meetings and events.